In the previous post we discussed how a traditional data access based layering can cause grief and sorrow. We’ll now move on to a better design and we’ll start with – what else – the domain layer. It is the heart of software, as Eric Evans put it, which should be the centre of the application. It should reflect our business entities and rules as close as possible. It will be an ever-evolving layer where you add, modify and remove bits of code as you get to know the domain better and better. The initial model will grow to a deep model with experimenting, brainstorming and knowledge crunching. Before we dive into any code we have to discuss a couple of important terms. The domain layer is so important that an entire vocabulary has evolved around it. I promise to get to some real C# code after the theory. 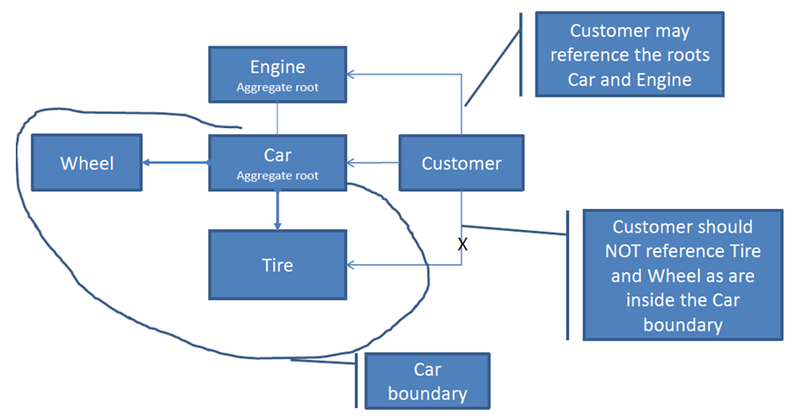 Domain objects can be divided into entities and value objects. An entity is an object with a unique ID. This unique ID is the most important property of an entity: it helps distinguish between two otherwise identical objects. We can have two people with the same name but if their IDs are different then we’re talking about two different people. Also, a person can change his/her name, but if the ID is the same then we know we’re talking about the same person. An ID is typically some integer or a GUID or some other string value randomly generated based on some properties of the object. Once the entity has been persisted, its ID should never change otherwise we lose track of it. In Sweden every legal person and company receives a personal registration number. Once you are given this ID it cannot be changed. From the point of view of the Swedish authorities this ID is my most important “property”. EntityA == EntityB if and only if EntityA.ID == EntityB.ID. Entities should ideally remain very clean POCO objects without any trace of technology-specific code. You may be tempted to add technology specific elements such s MVC attributes in here, e.g. [Required] or [StringLength(80)]. DON’T DO THAT. EVER! We’ll see later where they belong. A value object on the other hand lacks any sort of ID. E.g. an office building may have 100 windows that look identical. Depending on your structure of the building you may not care which exact window is located where. Just grab whichever and mount it in the correct slot. In this case it’s futile to assign an ID to the window, you don’t care which one is which. Value objects are often used to group certain properties of an Entity. E.g. a Person entity can have an Address property which includes other properties such as Street and City. In your business an Address may well be a value object. In other cases, such as a postal company business, an Address will almost certainly be an Entity. A value object can absolutely have its own logic. Note that if you save value objects in the database it’s reasonable to assume that they will be assigned an automatic integer ID, but again – that’s an implementation detail that only concerns how our domain is represented in the storage, the domain layer doesn’t care, it will ignore the ID assigned by the data storage mechanism. Make sure that you allocate the best and most experienced developers available at your company to domain-related tasks. Often experienced programmers spend their time on exploring and testing new technologies, such as WebSockets. Entry-level programmers are then entrusted to construct the domain layer as technologically it’s not too difficult: write abstract and concrete classes, interfaces, methods, properties, that’s it really. Every developer should be able to construct these elements after completing a beginners’ course in C#. So people tend to think that this is an entry-level task. However, domain modelling and writing code in a loosely coupled and testable manner are no trivial tasks to accomplish. Domains are the most important objects in Domain Driven Design. They are the objects that describe our business. They are so central that you should do your utmost to keep them clean, well organised and testable. It is worth building a separate Domain layer even during the mockup phase of a new project, even if you ignore the other layers. If you need to allocate time to maintain each layer within your solution then this layer should be allocated the most. This is important to keep in mind because you know how it usually goes with test projects – if management thinks it’s good then you often need to continue to build upon your initial design. There’s no time to build a better application because suddenly you are given a tight deadline. Then you’re stuck with a domain-less solution. Domain objects should always be the ones that take priority. If you have to change the domain object to make room for some specific technology, then you’re taking the wrong direction. It is the technology that must fit the domain objects, not vice versa. Domain objects are also void of persistence-related code making them technology agnostic or persistence ignorant. A Customer object will not care how it is stored in a database table, that is an irrelevant implementation detail. Domain objects should be POCO and void of technology-specific attributes, such as the ones available in standard MVC, e.g. [Required]. Domain objects should be clear of all such ‘pollution’. Also, all logic specific to a domain must be included in the domain. These business rules contain validation rules as well, such as “the quantity should not be negative” or “a customer must not buy more than 5 units of this product”. Resist the temptation to write external files, such as CustomerHelper etc. where you put domain-specific logic, that’s not right. A domain is responsible to implement its specific domain logic. Example: in a banking application we may have an Account domain with a rule saying that the balance cannot be negative. You must include this validation logic within Account.cs, not in some other helper class. If the Account class has a complex validation logic then it’s fine to factor out the IMPLEMENTATION of the validation. i.e. the method body to a separate helper class. However, having a helper class that totally encapsulates domain validation and other domain-specific logic is the incorrect approach. Consumers of the domain will not be aware that there is some external class that they need to call. If domain specific logic is placed elsewhere then not even a visual inspection of the class file will reveal the domain logic to the consumer. Make sure to include logic specific to a single domain object. Example: say you have an object called Observation with two properties of type double: min and max. If you want to calculate the average then Observation.cs will have a method called CalculateAverage and return the average of min and max, i.e. it performs logic on the level of a single domain object. In the next post we’ll look at how these concepts can be written in code.